I’m excited to announce the first installment of Gwarlingo’s new Sunday Poem series. I want to thank Andrea Cohen for sharing her new poem “Tender” with Gwarlingo readers. I’m a long-time fan of Andrea’s work, and I’m grateful she agreed to be the featured poet for the series debut. Why a Sunday Poem Series? Of all artistic mediums, poetry may be the one that is criticized most for “preaching to the choir.” How many times have I heard, “The only people reading poetry today are other poets”? This isn’t true, of course, but it is true that it’s increasingly difficult for poetry to attract a general audience the way films and novels can. But poetry can be just as rewarding as these other mediums. Poetry doesn’t have to be difficult or obscure to be meaningful, and it doesn’t have to be trite or sentimental to be accessible. My favorite poets, like many of my favorite photographers and songwriters, are able to capture the small, fleeting moments of everyday life, as well as expose larger patterns–they are able to compress and connect disparate ideas and images using inventive language, rhythm, and forms. The poet’s gift is knowing what is most essential. I created Gwarlingo because I wanted to share great work–regardless of the artistic medium–with an appreciative, smart, open-minded audience. I also wanted to do this in a conscious way that reduced online noise, instead of adding to it. Many of us are in a continual state of information overload. We are overwhelmed by too much choice, too much hyperbole. It’s not that we don’t care about poetry or painting, it is just hard for these mediums to compete. We need quiet, contemplative sanctuaries in our online lives. And so it occurred to me…Wouldn’t it be nice to open your email on a Sunday morning and find a specially chosen poem nestled between that Facebook message and that dire plea from the Nigerian prince? Many of us begin Sundays with a cup of coffee, a walk, the newspaper, brunch with friends, or some meaningful spiritual pursuit. Poetry is a fitting companion to these leisurely activities. Gwarlingo’s Sunday Poem series is also a nod to Wallace Stevens’ poem “Sunday Morning,” a work I’ve loved since my college days. This is the only time I’m going to clutter the Sunday Poem page with a long introduction. From this point forward, the series will be short and simple–a single poem along with a brief biography. I look forward to sharing the work of some of my favorite poets with you in the weeks and months ahead. 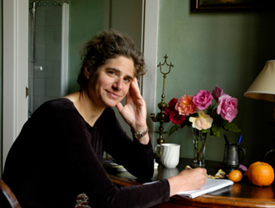 Andrea Cohen’s poetry collections include Long Division, The Cartographer’s Vacation, and her newest book Kentucky Derby (a collection I heartily recommend). Her poems and stories have appeared in Poetry, The Atlantic Monthly, The Threepenny Review, Glimmer Train, Memorious and elsewhere. She has received a PEN Discovery Award, Glimmer Train’s Short Fiction Award, the Owl Creek Poetry Prize and several fellowships at The MacDowell Colony. Andrea also directs the Blacksmith House Poetry Series in Cambridge, Massachusetts (if you’re a poetry lover in the Boston area, you should check out this great series). For more information about Andrea and her work, please visit her website. 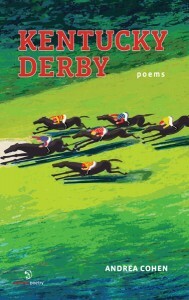 Her latest poetry collection, Kentucky Derby, is available at Amazon or at your local bookstore. Give me back my hours.